Salvaging is the practice of obtaining items from wrecks, which are left behind after a ship (NPC or player) is destroyed. Wrecks may contain loot (which can be taken by anyone) and salvage (which requires specialised equipment to recover). Salvaging is a good secondary income source when doing PvE combat, as NPC wrecks can drop valuable modules or items, and their salvage is used to manufacture rigs. Salvaging is easy to train into, reasonably safe, and a good way for newer characters to participate in higher-level PvE content (e.g. locust fleets). Every time a ship is destroyed, a wreck is left behind. This wreck may contain loot (e.g. modules from the destroyed ship), which can be taken by anyone nearby. Yellow icon: Wreck belongs to another player/corporation/fleet, and may not be looted without incurring a suspect timer (which allows any other pilot to freely attack you for 15 minutes). A ship must be within 2500 m of a wreck in order to loot it (i.e. take its contents). Salvage is successful and the Salvager uncovered something of value, which is automatically deposited into the ship's cargo hold. The wreck disappears. Salvage is successful but the Salvager didn't uncover anything of value. The wreck disappears. Salvage was unsuccessful. The Salvager will automatically start a new cycle and continues until the salvage is successful. When using salvage drones, the drones will need to be launched into space, target the wreck, and then commanded to salvage it. They will fly to the wreck (fairly slowly), orbit it, and attempt to salvage it. After each cycle (10 seconds), as above, if one of the drones was successful, it will fly automatically back to the ship and deposit the salvage into the cargo hold. Salvage drones can also be commanded to "Salvage" without having any wrecks targeted; they will then salvage all the wrecks in your vicinity (up to the pilot's drone control range) one-by-one. If a wreck was not looted before it was salvaged, its contents (loot) will appear in a storage container in space where the wreck was. This container can then be opened to obtain the loot inside; salvaging will not destroy the loot. All of the above apply to salvaging wrecks which belong to the salvager (or the salvager's fleet). Pilots can also salvage wrecks belonging to other players/fleets, but with some restrictions. These are the ship modules, implants, and items which are relevant when fitting a ship for salvaging. Alternatively, salvaging can also be done with salvaging drones, which need no modules, only a drone bay (and which are not affected by any other modules and implants). Salvagers are the main tools for salvaging wrecks. Activate it on a wreck to salvage the wreck. It can be useful to keep at least one in a ship's hold for convenient refitting. There is a Tech 2 variant (Salvager II) which is more efficient at salvaging, but is also more expensive and needs additional skill training. Salvage Drones Can be used to salvage wrecks. They have much lower success chance than the salvager module but they can operate at longer ranges and do not need managing. Tractor Beams tractor wrecks from afar to your ship. It is possible to salvage without a tractor beam, but these modules make salvaging a lot easier. They pull the wrecks (and containers) to your ship, making flying to each wreck unnecessary. They are a little more expensive (about a million ISK), but they speed up salvaging considerably. By default, Tech I tractor beams can target wrecks up to 20 km away, and pull them in at 500 m/s; a Noctis will boost this up to 2000 m/s at up to 80 km (depending on skills). Salvage Tackle Rig increases your chance to salvage by 10% (15% for the Tech 2 rig), which increases your salvaging efficiency. Mobile Tractor Units are deployable structures which automatically tractor all nearby wrecks (and containers) and loot their contents. While MTUs don't salvage wrecks, they do collect them into a compact space, alleviating the need to tractor them (or to fly to them). They have an enormous range (125 km for the basic unit), but only tractors in one wreck at a time, and don't do it particularly quickly (1000 m/s). However, once deployed they continue to work even if you fly away. Poteque 'Prospector' Salvaging	SV-905 (slot 9), which increases your chance to salvage by 5%. Poteque 'Prospector' Environmental Analysis EY-1005 (slot 10), which reduces salvager modules' cycle time by 5%. Both of these are only of interest to players who want to get every last drop of salvaging efficiency. Afterburner or MicroWarp Drive: Even with a tractor beam, ships may still need to do a lot of flying around to reach every corner of a wreck field, and the speed boost comes * Expanded Cargoholds: Depending on the base size of a ship's cargohold, it can be useful to fit these, as these allow a ship to carry more salvage at a time (and reduce the number of round trips to the nearest station). Auto-Targeting System (high slot) or Signal Amplifier (low slot): When pilots with low targeting skills are flying a dedicated salvaging ship with many salvagers and tractor beams, it might be worth fitting one of these modules so that they can target (and therefore salvage/tractor) several wrecks at once. However, this should only be a stop-gap measure until the pilot's targeting skills are improved. Note that the Auto-Targeting System will not automatically target wrecks (it only targets hostile ships), so in this case it is fitted solely for its bonus to the number of targets the ship can have locked at once. Turret destroyers ( Coercer, Cormorant, Catalyst, and Thrasher) make for excellent beginner salvaging ships. They have eight high slots, allowing pilots to salvage many wrecks simultaneously. They also have a decent amount of cargo space and are moderately fast, not to mention very reasonably priced. Their main weakness is a rather small capacitor, so they may not be able to salvage continuously with all eight Salvagers. The missile and drone destroyers ( Dragoon, Corax, Algos, and Talwar) are also decent salvagers, but have fewer high slots. The Noctis is both the next and last step in salvaging ships. It has the same eight high slots as a destroyer, but comes with a huge bonus to tractor beam speed and range; with good skills its tractor beams can reach out to 80 km, hoovering up wrecks from an entire battlefield. Additionally, it gets a bonus to the cycle time of salvaging modules, reducing the time it takes to salvage each wreck. The Noctis is the best salvaging ship by miles; its only downsides are its somewhat weak tank (compared to the value of the salvage it often carries), its slow speed, and its steeper price tag of around 70 million ISK. PvE Droneboats rely on their drones to deal damage, and so have free high slots which can be fit with tractor beams and salvagers. Any ship with a sizeable drone bay can usually fit in five salvage drones (which only take up 5 m3 per drone, the same as a light combat drone), which can be deployed when the additional firepower from combat drones is not needed. Marauders are Tech 2 battleships designed for high-level mission running. They have free high slots which can be used for tractor beams and salvagers (as well as a bonus to tractor beam velocity and range) and a large cargo hold, but are ruinously expensive ships (easily 2 billion ISK for ship and modules) and require specialised skills. The recommended dedicated salvaging ships have eight high slots, which are usually fitted with four salvagers and four tractor beams. This way, you can be salvaging four wrecks at a time, while your tractor beams are pulling in four more. Once you have gotten your feet wet, feel free to tweak this setup - you can fit five tractor beams and three salvagers if your salvaging skills are very good (i.e. your salvagers need fewer cycles per wreck) or if you are salvaging "on the move" (in which case the extra tractor beams are needed to keep pulling the wrecks behind you while your salvagers work). Alternatively, you can fit more salvagers and fewer tractor beams in very concentrated wreck fields (or fit only salvagers if you previously deployed a Mobile Tractor Unit). Your mid slots should almost always include a propulsion module (afterburner or microwarp drive), except perhaps if you're flying a Noctis with very good skills (which extends the range of your tractor beams so much that you won't need to move). If you're flying a Destroyer you will likely run out of capacitor regularly, so consider fitting a Capacitor Recharger or Capacitor Battery; the Noctis generally has enough capacitor and doesn't need capacitor modules. Fill your remaining mid slots with tanking modules. For your low slots, consider fitting an expanded cargohold on salvaging destroyers (the Noctis' base cargo hold is usually large enough), and use the remaining slots to improve your ship's tank, agility, and maximum speed. Rig slots can either be used to improve your ship's tank or to gain some salvaging efficiency by fitting Salvage Tackle rigs. Any dedicated salvaging ship with a drone bay should fly salvaging drones. Additionally, consider including ECM drones if you're afraid of being attacked by other players. Salvaging (3x, 1M ISK): The basic skill required for salvaging with salvager modules. Every new character starts at level III, which is enough to start out with - however, since each level trained decreases the number of cycles a Salvager module takes to salvage each wreck, training this to higher levels to improves salvaging efficiency. To step up to Salvager II modules, train this to level V.
Salvage Drone Operation (4x, 500k ISK): The basic skill required for salvaging with salvage drones. Salvage drones are available right at level I, but training this to III or higher will decrease salvaging time further. Needs Drones IV (1x). <race> Destroyer: Pilots only need to train this skill to level I to fly a given race's destroyers, but will not receive additional benefits to salvaging by training it beyond level I. ORE Industrial (4x, 2.5M ISK): This skill is required to fly the Noctis, and higher levels really pay off for pilots who are serious about salvaging. When combined with the Noctis, each level of this skill gives bonuses to tractor beam range, tractor beam velocity, and salvager cycle time. Pilots who will intend to fly a Noctis regularly should train this to at least level III. targeting skills to improve targeting time, targeting range and number of targets that can be locked simultaneously. Capacitor Management and Capacitor Systems Operation to improve ship's capacitor capacity and recharge rate, which becomes important when flying a Destroyer and fitting a large number of salvager modules (which use more capacitor than tractor beams). When first approaching a wreck field, make sure your Overview settings show wrecks, turn on the Tactical Overlay, and bookmark a wreck near the centre of the field with the maximum number of wrecks within your ship's tractor beam range. Fly (or warp) to this bookmark, and stop your ship. Use your tractor beams to pull more distant wrecks to within 2500m of your ship (as you'll want to loot them in addition to salvaging them); once they are within range, turn the tractor beams off, and re-target them on additional distant wrecks. Simultaneously, target nearby wrecks with your salvagers, using one salvaging module per wreck (except for very difficult Sleeper wrecks), and letting them run until the wreck is salvaged, then targeting the next nearby wreck for salvaging. While the salvagers are running, loot the wreck. Since you'll be juggling a lot of wrecks and modules, keep in mind that you can click on the module icon underneath a targeted wreck to stop that specific module from cycling - useful for turning off the right tractor beam once it's pulled a wreck close to your ship. Also, learn the keyboard shortcuts for targeting and activating/disactivating modules, as it will save you a lot of clicking. If you're flying a fast and agile ship (i.e. a Destroyer instead of a Noctis), then it may be faster to create a bookmark 150 km away, warp to it, then warp back to a wreck, instead of slow-boating around the wreck field. Mobile Tractor Units and salvaging drones can support your ship's salvagers and tractor beams, but are considerably slower. However, they can be used for a minimum-effort approach to salvaging (even though it's considerably less efficient): deploy a Mobile Tractor Unit at the start of an engagement, which will pull all the wrecks you create into a tight ball (and loots them for you). When you have destroyed all the enemies, fly close to the MTU, deploy your salvage drones, and order them to salvage all nearby wrecks. Then sit back and watch your drones work. You may want to occasionally reposition your ship to be as close as possible to the wrecks - salvage drones fly slowly (900 m/s, plus skill bonuses) and they have to return to your ship to drop off their salvage. As an aside, wrecks of player ships can be salvaged in the same way as wrecks of NPC ships. If you run missions or rat, you can augment your income by salvaging the wrecks you produce. However, it may not be worth your time, as you could be spending your salvaging time running another mission or killing more rats - but it's up to you how to spend your time (also taking into account what activities you enjoy in the game). As a rough guide, mission salvaging only yields significant profits for level 3 missions and above. While some ships can fight and salvage, it's often a better idea to switch to a dedicated salvaging ships (or have a salvaging alt), as salvaging large wreck fields with anything but a dedicated salvaging ship can be frustratingly slow. Wrecks persist for two hours, so you may want to run a few missions (or rat in a few asteroid belts), bookmarking each wreck field, before switching to a salvaging ship. Mobile Tractor Units can be very useful here - drop one in each mission (they are somewhat bulky, so you may have to return to a station to pick up more), and let them work while you complete additional missions. When you return with your salvaging ship, all the wrecks will be in a nice compact ball, allowing you to forgo tractor beams in favour of a full rack of salvager modules. Alternatively, if you have a salvaging alt that you can multibox (on a separate account), you can have them follow your combat character, but lagging one wreck field "behind" (to prevent your fragile salvaging ship from being targeted by rats). Keep in mind that, once you have completed a mission, all the acceleration gates disappear, making it possible to warp directly to any bookmarked wreck field. PvE fleets (e.g. locust fleets which tackle high-level PvE content are often in need of a dedicated salvager to follow the fleet. Make sure to agree how to split the salvaging proceeds with the other fleet members beforehand; it's common for the proceeds to be split evenly between all fleet members. This role can easily be filled by a new player in a Destroyer, and is a great way to start flying with fleets. The fleet window logs all wrecks that are looted or salvaged, which can be used to check if a salvager is "stealing" some of the loot (i.e. not reporting the full value to be shared with the other fleet members). Sleepers (the NPCs in wormholes) can be salvaged as usual, but keep in mind that some of the sleeper wrecks take a long time to salvage, even with good salvaging skills. Often, a salvaging ship in wormhole fleets is also responsible for looting the sleeper wrecks; since Sleepers don't have bounties, this loot is the main income source for wormhole PvE. This makes salvaging ships prime targets for hostile players, and even a solo Stealth Bomber can destroy a salvaging ship. Therefore, unlike with K-space salvaging, stay with your fleet, keep an eye on D-Scan, and consider fitting Warp Core Stabilizer modules in place of Expanded Cargohold modules (as Sleeper loot takes up comparatively little volume). The materials obtained from salvaging are used in the manufacture of rigs, and if you don't want to manufacture rigs yourself there are plenty of manufacturers looking to buy these materials. Even though individual materials are usually not worth a lot, their value does add up - be aware of potential suicide gankers when hauling large amounts of salvage. Salvage materials with an orange background is Tech I salvage (used when manufacturing Tech I rigs), while material with a blue background is Tech II salvage (for Tech II rigs). Additionally, salvage from Sleeper NPCs is used in the manufacture of Strategic Cruisers. Wrecks are flagged as "belonging" to the player/corporation/fleet who created them (i.e. who destroyed the ship). You can loot a wreck belonging to someone else (marked in yellow on the Overview), but you will receive a suspect timer, allowing any other pilot to freely attack you for 15 minutes. However, you can salvage wrecks belonging to someone else without any game mechanics consequences; this is called "ninja salvaging", whereby people salvage without the wreck owner's permission. Members of EVE University are not allowed to salvage wrecks belonging to others. The defining mechanic for salvaging is the "salvaging chance", which is the probability that you will successfully salvage the wreck in one cycle of your salvaging module/drone. As explained above, if you fail a salvaging attempt, your module/drone will continue cycling until you succeed - so the probability is an indication of how many cycles (i.e. time) it takes to salvage a wreck (or, in the case of very difficult wrecks, allows you to salvage them at all). Improving your chance to salvage does not give you better salvage. Note that the chance to salvage is not affected by stacking penalties. Sleeper Large Advanced Wrecks: -20%. Using a Salvager I module improves your salvaging chance by 5% per level of the Salvaging skill, up to +25% at level V. Once you have trained Salvaging V, you can use the Salvager II module, which improves your salvaging chance by 35%. Salvage Tackle I rigs improve your salvaging chance by 10% each (and you could, if you wanted, fit several). Salvage Tackle II rigs improve your access chance by 15% each, but (like most Tech II rigs) are hideously expensive. The Poteque 'Prospector' Salvaging SV-905 implant (it fits into slot 9) improves your salvaging chance by 5%. Lastly, the Poteque 'Prospector' Environmental Analysis EY-1005 implant (it fits into slot 10) and each level of ORE Industrial when flying a Noctis reduces the cycle time of your salvaging modules by 5%. If you're using Salvage Drones, they improve your salvaging chance by 3%, plus 2% for each level of the Salvage Drone Operation skill you have trained (up to a total of +13% at skill level V). There are no other ways of improving the salvaging chance of salvage drones. A beginner salvaging pilot with Salvaging III, fits her ship with a single Salvager I module, and tries to salvage a small basic wreck. The base chance to salvage a small basic wreck is 30%, and her skills and module give her a bonus of 3 * 5% = 15%. Therefore, her chance to salvage the wreck on each cycle of her salvager module (10 seconds) is 30% + (3 * 5%) = 45%. On average, it will therefore take 2.2 cycles (22 seconds) to salvage the wreck.. Buoyed by her initial success, the pilot heads to more remote areas of space, and encounters large basic wrecks. Her chance to salvage these is 10% + (3 * 5%) = 25%; therefore, on average, it will take 4 cycles (40 seconds) to salvage each wreck. Heading deeper into space, she encounters small advanced wrecks (chance to salvage 0% + (3 * 5%) = 15%, taking 6.7 cycles (1 minute and 7 seconds) on average) and even some sleeper large advanced wrecks (chance to salvage -20% + (3 * 5%) = -5%; she will not be able to salvage these wrecks). Determined to increase her salvaging efficiency, she trains up her Salvaging skill to level V, and installs a Salvager II module. With this setup, her chance to salvage a large basic wreck is 10% + (5 * 7%) = 45%; on average, it will take her 2.2 cycles (22 seconds) to salvage. Even a sleeper large advanced wreck succumbs to her salvaging powers, within 6.6 cycles on average. The following table shows the average number of salvager module cycles (and time) to salvage a wreck. Various player setups are shown for comparison - these are by no means the only salvaging setups, but are meant to illustrate the effect of investing in higher-end salvaging equipment. "Beginner": Salvager I module and Salvaging III. This gives a +15% salvaging chance. "Intermediate": Salvager I module and Salvaging IV. This gives a +20% salvaging chance. "Journeyman": Salvager II module and Salvaging V. This gives a +35% salvaging chance. "Advanced": Salvager II module and Salvaging V, flying a Noctis with ORE Industrial III. This gives a +35% salvaging chance, and a 15% reduction to module cycle time. "Professional": Salvager II module and Salvaging V, flying a Noctis with ORE Industrial IV and a Tech I Salvage Tackle rig. This gives a +45% salvaging chance, and 20% reduction to module cycle time. "Expert": Salvager II module and Salvaging V, flying a Noctis with ORE Industrial IV and two Tech I Salvage Tackle rigs. This gives a +55% salvaging chance, and 20% reduction to module cycle time. "God mode": Salvager II module and Salvaging V, flying a Noctis with ORE Industrial V, three Tech II Salvage Tackle rigs, and both a Poteque 'Prospector' Salvaging SV-905 and a Poteque 'Prospector' Environmental Analysis EY-1005 implant. This gives a +85% salvaging chance, and a 30% reduction to module cycle time. This graph shows the relationship between module cycle time and salvaging chance bonus. 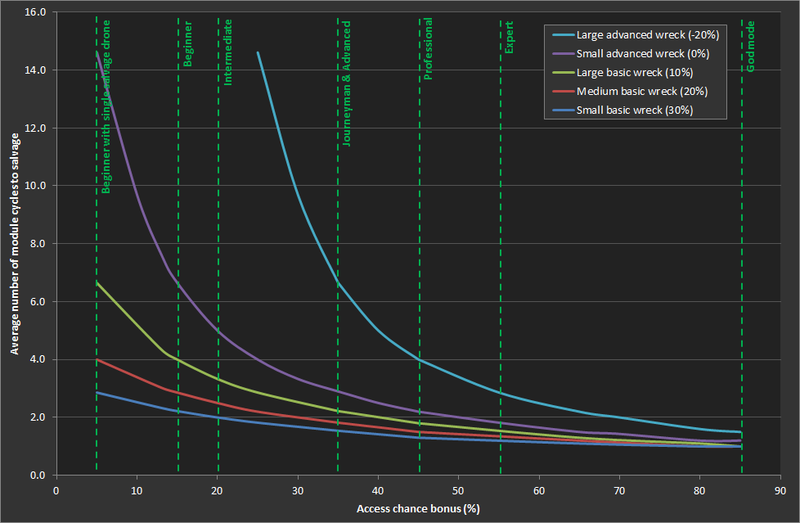 Increasing the salvaging chance bonus is key to salvaging efficiently. While the early increases yield dramatic improvements, these improvements taper off and later increases are not only more costly to get (as they need more expensive rigs, modules and implants), but provide fewer and fewer additional benefits. The "sweet spot" for serious salvaging is around +50% salvaging bonus - this gets you about 80% of the way to the absolute maximum possible (+85% salvaging bonus), but doesn't need any of the really expensive Tech II rigs. the best way to get to around +50% is to fit a Salvager II module and one or two Tech I salvaging rigs. If you have the option of flying a Noctis, its cycle time bonus really starts to shine above about +40% salvaging bonus, at which point it gets ever more costly to further increase your salvaging chance bonus. However, if you don't want to fly a Noctis, then a salvaging destroyer can do its job almost as well, but usually needs about 1-2 additional salvaging rigs to compensate for the Noctis' cycle time bonus. Salvaging in wormholes, particularly the advanced larger sleeper wrecks, represent a significant increase in difficulty compared with k-space salvaging. Therefore, serious wormhole salvagers may want to consider installing three Tech I salvaging rigs (in addition to using Salvager II modules). At the very least a +25% salvaging chance bonus is needed to even attempt to salvage advanced large sleeper wrecks. "Beginner": 1 salvage drone and Salvage Drone Operation I. This gives a +5% salvaging chance. "Intermediate": 5 salvage drones and Salvage Drone Operation III. This gives a +9% salvaging chance. "Journeyman": 5 salvage drones and Salvage Drone Operation IV. This gives a +11% salvaging chance. "Advanced": 5 salvage drones and Salvage Drone Operation V. This gives a +13% salvaging chance. Unlike with modules, where it almost never makes sense to use more than one salvager module on a single wreck, salvage drones will always work together on a single wreck. Additionally, note that the drones have to travel to the wreck and return to your ship with the salvage, increasing the time they need to salvage. This table shows that there are significant diminishing returns above Salvage Drone Operation III, and it's probably not worth training additional skill levels beyond that. Additionally, even though a flight of five salvaging drones with reasonable skills can approach the same salvaging rate as a single salvager module, most salvaging ships will fit four or more salvaging modules, and will therefore always outperform salvage drones. On the other hand, if time is not a factor, then salvage drones offer a very hands-off method of salvaging. Lastly, travel time should be taken into account when using salvaging drones - salvaging a wreck 5 km away easily adds ten seconds to the salvaging time (as the drone needs to fly to the wreck, salvage it, and return to your ship), so, if possible, keep your ship as close to the wrecks as possible (or use a Mobile Tractor Unit to pull all the wrecks into a ball). The type of salvage you get depends on the faction of the wreck that is being salvaged. This page was last modified on 23 November 2018, at 08:06. This page has been accessed 510,630 times.